"What this country needs is a short, victorious war to stem the tide of revolution." 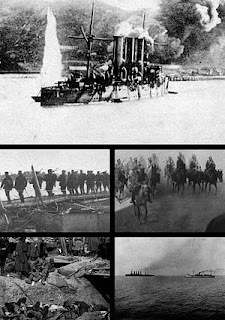 The first war to be fought completely within the 20th century, the Russo-Japanese war was a preview of the First World War and a harbinger of many of the troubles that would follow in the later years. Despite the apparent simplicity of the conflict, there were wheels within wheels and the diplomatic state was very confused. However, the conflict was one of the most decisive and unexpected victories that the world had ever seen, as, for the first time, an Asian state defeated one of the European great powers. Quick bit of background first. The Japanese had developed rapidly in the years after their ‘discovery’ and opening by Admiral Perry. They had swiftly built up a small, but efficient army and navy that was a fair match for the European forces, although the Japanese could not hope to match the numerical superiority of the French, German or Russian armies. The Japanese, therefore, decided to join the forces that were nibbling away at China and declared war in 1898, swiftly defeating the Chinese forces and occupying vital strategic points. However, the European powers decided not to allow this upstart nation to keep its gains and an alliance of France, Germany and Russia faced down the Japanese and compelled them to return most of their gains. Japan was humiliated by this exercise in naked power. Despite her participation in the multinational force sent to relive besieged Peking during the Boxer Rebellion, in which she was treated as an equal for the first time, she still felt deep resentment at her treatment. Forging an alliance with Britain, the Japanese prepared a surprise attack on the Russians. For their part, the Russians were supremely confident of victory and expected the war to reforge the nation and the Tsar’s power. However, the Russian incompetence, poor planning and logistic difficulties – not to mention social upheaval – allowed the Japanese to win the war. That was not written in stone. The Russians had countless chances to gain an advantage over the Japanese and a better diplomatic position. There were proposals made by the commanding officers to the Tsar that the Tsar rejected, many of which would have strengthened the Russian position – and finally, there were a number of international incidents, which could have turned a small war into the first world war. Possibly the first possible change in events – unless you don’t allow the war to happen at all – is the Japanese landings at Chemulpo. The Russians became aware, at least at a local level, that the Japanese were landing, but they did nothing. If the Russians had attempted to interfere with the landings, however, there is a good chance that they would succeed in preventing the Japanese from landing or at least slowing them down. In which case there would be a good chance of winning the war, or buying time for the reminder of the Russian army to mobilise. Another possibility comes from the early naval action at Port Arthur. The Japanese successfully bottled up the Russian far eastern fleet there, but then managed to leave a possible threat behind them, meaning that they needed to keep their fleet near the Russian harbour. If the Japanese had sunk the Russian fleet, however, there are two possibilities. The first one is that the Russians would be discouraged from sending the Baltic Fleet halfway around the world and probable Japanese defeat when they ran out of supplies. The second is that the Tsar might decide to make peace after the loss of the fleet. After their successful landing, the Japanese advanced towards the Yalu River, where the Russians had encamped. The Russians failed to detect the Japanese ‘spearpoint’ and therefore a small force had to fight off the main Japanese attack. Unsurprisingly, they failed, while the Russians had not kept a reserve in place to seal up the gap. This victory convinced the bankers in London and New York that the Japanese could fight and therefore allowed the Japanese to take out more loans. If the Russians had stopped the Japanese here, or even delayed them for a time, it might have made the bankers and foreign governments more hesitant and made the Japanese economic problems worse. As the Japanese army approached Liaoyang, it appeared that China might join the war on the side of the Japanese, eager for a chance at revenge against the Russians. Just how strong this feeling was is unclear, although thousands of Chinese served with the Japanese, they were rarely in combat situations as combat troops. If the Chinese government did join the war, they would help the Japanese out to some extent, even to supplying them with weapons they were either unwilling or unable to use themselves. However, Chinese intervention would almost certainly mean French and British intervention, although French intervention would be difficult without British support. I suspect that the British would pressure the Japanese to end the war at that point before the unequal treaty framework collapsed completely. The single most tragic battle – both for the casualty lists and for the lessons for WW1 that were ignored – was the battle for Port Arthur. The Russians had heavily fortified this fortress and expected it to be able to hold out for an indefinite period. The Japanese expected to take it quickly, but lost thousands of men on useless attacks before managing to gain a commanding position. This delay cost the Japanese the chance to capture the Russian fleet and the possibility of extra reinforcements for the advance to Mukden. There are really two possibilities here: if the fortress had fallen quickly, the Japanese might have captured much of the Russian fleet and then had extra forces to push upwards, perhaps defeating a Russian army instead of pushing it backwards. On the other hand, if the Japanese losses had been significantly higher, their army might have run out of steam much sooner and before the Russians had decided that the war was lost. Total Japanese defeat would then become very possible. A different possibility comes from the Russian retreat and subsequent build-up at Mukden. The Tsar pushed the Russian commanders into several small offensives against the Japanese positions, which failed, although a few alarmed the Japanese. What if one of them had succeeded? The destruction of a Japanese army would keep the Russians in the war longer, which would probably mean a draw or a Russian victory. Related to that change, what if the Japanese managed to wipe out a major Russian force? That’s actually more likely than a Russian victory, as the Japanese were far better at manoeuvring and the Russians lacklustre at best. If a large Russian force was to be wiped out for nothing, it makes the position of the Tsar far more precarious. He may sack the Russian commander earlier than OTL, which places a real moron instead of a pragmatist in command. One reason that the Russians gave up in 1905 was the outbreak of revolution in Russia, fuelled by the reports of Russian disaster in Manchuria and the massive shortage of food as rolling stock went east. In OTL, those revolts were quickly suppressed by granting the Duma a few concessions and massive violence. What if there had been a prolonged period of disturbance? Nationalists in the recently conquered parts of the empire and Poland might see a chance to regain independence. Germany and Austria-Hungary might take the territory that Germany took in 1917. Japan might take more territory than OTL. As I’ve noted before, world wide war seemed a distinct possibility at several points, but the worst of them all was the Dogger Bank incident. The Russians had sent a fleet on the long voyage round the world to Japan. En route, the Russians mistook a British fishing fleet for Japanese torpedo boats and opened fire. After much argument, the Russians apologized, but they were basically unrepentant. The British public demanded war, so what might have happened if they had declared war on Russia? The British fleet would have had no difficulty sinking the Russian fleet and adding extra support to Japan, but the Russians would almost certainly pressure the French into joining the war. In which case, the Japanese would have to fight the French ships in the Far East (of which there were only a few) and the British would end up fighting their home fleet. On the naval front, however, the war would go to the British and Japanese. However, what about the army side of things? Britain is not a great land power and there are few points where the small British forces would be decisive. They would probably send a division or two to support the Japanese in Manchuria, while attacking French colonies. This would present its own problems, as the French had powerful colonial forces and there would be serious havoc. The longer the war went on, the stronger the Russians would become in Manchuria and there would be problems across the British Empire. The Boers, for example, might consider ‘renegotiating’ the peace treaty from 1900. The best solution the British could find would be to make a deal with the other European powers, Germany and Austria-Hungary. That would give their alliance the muscle to stand up to the Franco-Russian alliance. Imagine WW1 with the British on the German side. It is highly unlikely that the French could have defeated such a combination, which would let them get hammered by the Germans, then the Germans would carve themselves an empire out of the Ukraine and Byelorussia. The problem, for the Japanese, would be hanging on in Manchuria until the Russians collapsed. One of the most interesting possibilities from the war, although not directly related to the outcome, was the life of a brave cavalry officer named Carl Gustav Mannerheim. Mannerheim, as we know, survived the war with distinctions, served the Russians on the Eastern Front in 1914, returned to Finland and commanded the White Guard in the brief Finnish Civil War – and led his nation to survival in the Winter War (1939-40). What might have happened if Mannerheim had not survived the war? There were no other military leaders of his calibre in Finland in 1919, let alone 1939. The Finnish Civil War might have gone on long enough for the Red Army to re-enter in 1920, or perhaps allowed the Russians to defeat the Finns in the Winter War. The final possibility from the war is financial. The Russians refused to pay Japan anything after the war. Suppose the Russians were less tight-fisted or needed to end the war quickly – a longer period of disturbance might do it – and decided to pay Japan. Would the money help expand the Japanese system? Make it more stable? To conclude this article, I hope I’ve illustrated just how vital the Russo-Japanese war was to history. A Russian victory would have serious effects on the balance of power, as they would gain such predominance in North China and Korea that they would be very tempted to go for all the marbles and occupy China, perhaps with the support of the French and Germans. Further, the Russians used the shock of their defeat in OTL as an excuse to clean house, sack some of the more incompetent officers and improve their army. That the army was unable to survive a long war has obscured the fact that the Russian army of 1914 was an order of magnitude stronger, better equipped and commanded than the Russian army of 1904. Had that army collapsed in 1914, we would all be speaking German today, as the Germans would have had time to defeat France before the Russians could get mobilised and invade East Prussia. The Russo-Japanese war was a small war involving only two powers directly. It was, however, one of the most important wars in history. Go figure. These early tensions meant that when the Empire of Japan emerged from a long period of being largely isolated and determined, through the Meiji Restoration, to become a major power and not a European colony, Russia was at a disadvantage. From day one, the Japanese were, albeit carefully, willing to deal with powers such as France and Great Britain but were less well disposed toward Russia. For the Russians, geography made Japan a natural enemy. I liked your blog, Take the time to visit the me and say that the change in design and meniu?